(1) At least one overnight stop, (2) requires a whole day, (3) requires more than half a day &ndash; you may have time for a few turns (4) arrive by lunchtime and ski all afternoon, (5) there is a main airport within an hour of Val Gardena. (1) There are no buses or taxis to Val Gardena, (3) there are slow or infrequent buses / trains available, (5) getting to the resort is easy with frequent bus / train connections. (1) No places to stay in/near Val Gardena, (3) a few places to stay in the resort, (5) a wide variety of accommodation suitable to suit all budgets. (1) No luxury accommodation available, (3) just one or two luxury hotels so book ahead, (5) several up-market hotels in Val Gardena. (1) There are no child care facilities at Val Gardena, (5) the resort has excellent child-care facilities including at least one reasonably priced creche. (1) Occasionally gets enough snow for skiing, (2) is often closed due to a lack of snow, (3) occasionally suffers from a lack of snow, (4) rarely suffers from a lack of snow, (5) Val Gardena is snowsure even in the poorest seasons. (1) Val Gardena relies entirely on natural snow, (3) there are just a few snow cannons, (5) there are snowmaking facilities on all pistes. (1) There are no snow groomers at Val Gardena, (3) occasionally some pistes are left ungroomed and in a poor state, (5) all the runs at Val Gardena are groomed daily. (1) there is nowhere to ski when it is windy or visibility is bad and lifts often shut, (3) there are some trees for poor visibility but main lifts sometimes close, (5) Val Gardena is mostly in forest where you can ski in flat-light and windy days, lifts rarely close. (1) If snow conditions are poor at Val Gardena, it will be poor everywhere nearby, (3) there are good alternatives within an hours drive, (5) other locations on the same lift pass provide a rich variety of snowsure ski conditions. (1) Val Gardena usually has poor snow conditions compared to other resorts in region, (3) has average conditions for the region, (5) usually has the best snow conditions in the region. (1) The staff at Val Gardena are rude or unhelpful, (5) lift staff at Val Gardena are pleasant, cheerful and eager to help. (1) The ski runs are featureless and unvaried, (3) the ski runs are varied but not extensive enough for a week, (5) Val Gardena has diverse and interesting pistes including forests and high alpine terrain. (1) No intermediate terrain at Val Gardena, (3) intermediate skiers will get bored after a few days, (5) vast areas of cruising runs. (1) Not even a kicker at Val Gardena, (3) average sized park quite well looked after, (5) huge park area and expertly crafted pipes, jumps and boardercross trails. (1) There is nowhere to go for cross-country skiing around Val Gardena, (3) there are some cross country trails available, (5) the area features many spectacular and well maintained cross-country trails. (1) No designated luge or toboggan runs, (3) there are toboggan runs that open quite often, (5) Val Gardena has long and well maintained luge / toboggan facilities suitable for all ages. (1) Overall, Val Gardena is one of the most expensive ski resorts in the country and not worth the money, (3) overall represents average value for money, (5) overall offers the best value resort in the country. (1) Overall, Val Gardena is one of the most expensive ski resorts in the world, (3) overall it offers pretty average value for money compared to resorts from other countries, (5) internationally the resort offers excellent value for money. Stayed in Santa Christina last week in January this year. Have skied in 8 resorts now including North Amaerica and have to say I was incredibly impressed with this one. The slopes are perfectly groomed every morning, the on-piste restaurants/bars offer excellent foods at reasonable prices, the atmosphere is friendly and adult; not so many children around which I liked. The variety of slopes is incredible with plenty of fun parks/bordercross and in general just different things to do than just ski up and down! The sense of travel is second to none, we would often go to a different area for the day and then hit a few bars on the way back. Apres-ski in the snow bar every evening was stomping with a good mix between German and Anglophone music. Not much in Santa Christina besides the snow bar but a short free bus ride away (2km) Selva has a bit more going on with at least three decent bars with live music. Bit of a pain to get to/from Ireland but worth the 3 hour drive from Milan. I wouldn't recommend it for beginners (not many progression slopes and the slopes back to town are tricky in the evenings) but for intermediates and up it's a great place. Just back from a fabulous week's ski holiday. First time in the Dolomites; we have been used to Three Valleys and Porte Du Soleil in France. This is another huge 'linked' ski area with something for everyone (over 110 miles skied in 6 days). The geology means that the mountain panoramas were breathtakingly different and more wild west Colorado than Alps. In a low snow winter, the quality of pistes were outstanding; snow-making capabilities are famously good here. Particular favourites were over Dante Cepies into Colfosco and then up over Corvara. The big sunny motorway pistes down into St. Cristina were also a lot of fun. Lifts were generally excellent, but queues on key Sella Ronda lifts were horrific. However, given it was UK school half-term, most slopes were generally not too busy (Sella Ronda excepted). French half-term overlaps with UK, meaning French resorts are jammed during this week. Sella Ronda tour was fine, but more as an introduction to the area, to identify areas to return to, and ski more comprehensively. We did a Crystal day tour over to 'The Hidden Valley' We started with some ski-ing in Cinque Torri area (Cliffhanger filmed here) before moving over to a vertical tele-cabine up to La Gazuoi. The Fanes range, to the right of the run is majestic. The valley walls to the left are smaller and scattered with frozen waterfalls. The run twists and turns for 7 km, creating a mysterious, secret ambience. At the bottom of the trail, you have the option of taking the horse drag, a great experience, where you hold on to ropes pulled by a pair of horses as they take you along the flat frozen river bed to the next lift. Food and drink are all very reasonable, cost-wise, compared to Meribel, Courcheval etc. The whole area feels incredibly Austrian, although pizza and pasta are always high quality. As others have said, Luis Kellar was lively, but euro-apres-ski-pop was irritating after not too long. Best bar, in Selva, by far (avoiding 'Stars on 45' apres-trash) was Goalies further down the main road. They have the coolest Rock playlist, and a friendly atmosphere. Run by ex-ice hockey Goalies, Alex (dad) and Andreas (son). We stayed in Hotel Pineta, in Selva; very reasonable 3*, clean, good food. All in all, just a fantastic area, and one to which we will definitely be returning. What a great place that I would return to tomorrow and normally I always prefer to try somewhere new. Not silly expensive compared to France, good mountain food, lots of bars and restaurants. Lovely people and high enough for good snow. Went in January and it was surprisingly warm but still good; well groomed piste and more skiing than you can throw a stick at! Also, the Sella Ronda of course for a challenge if you want an early start. Go and enjoy Italy that feels like Austria. Good for anyone, families, couples or big groups. We stayed in Selva in 2012. 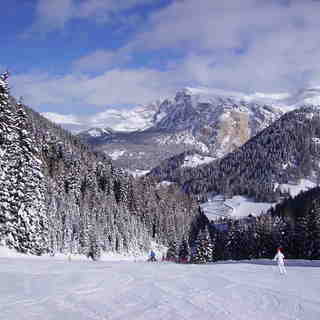 The Sella Ronda ski area is absolutely enormous and should keep every level of skier more than happy for a week or two. You can do the entire circuit, if you stay on the proscribed runs, in 4 to 5 hours but there is the occasional bottleneck as it's a popular thing to do. Although access to the main piste area from Selva itself is a bit of a slog, once into the area the skiing is fantastic; loads of challenging runs and plenty of cruising if that's what you want. The lifts were all fine, the occasional queues but that's to be expected. Pistes were excellent quality with plenty of places to stop for food and drink. There is not much in the way of après-ski with most bars etc pretty empty. Most places seem geared to the evening meal trade. We were there in February and would advise that you take the temperature forecasts seriously. We had minus 17 during the day and down to minus 30 at night! All in all, Selva val Gardena is one of the best ski areas I have been to but wrap up warm! 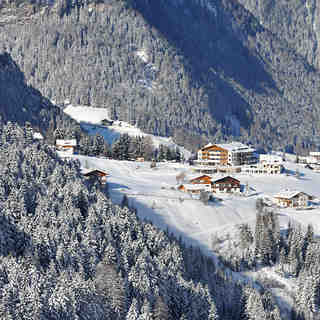 Great resort, fabulous varied skiing. Terrific long runs and the Sella Ronda is a great circular route which can be tackled both clockwise and anti-clockwise. Lovely resort with lots of bars and places to eat. Plenty of mountain restaurants and bars as well. Would go back. We were in Selva from 21st December to 4th January. What a strange little place. We had a great time, although their idea of Apres ski seemed more like apres dinner! Everyone went back to hotel etc for dinner (the food was a-maze-ing!) then went out at 10.30! We're used to Austria - Mayrhofen and St Anton where everyone enjoys apres ski while still in their boots!! Our favourite bar was Yellos. Great service, wine, complimentary nibbles.. (chocolate brownies on a couple of occasions) and music classy, modern decor. Great New Year's eve DJ. Louis Kellar was lively and typical euro music but they had the best shots! Great big paddles with 12 different schnapps in. Quite icy in places and Very cold. Hats were needed but the sun shone for the last 9 days and it's breathtakingly beautiful. Can't wait to go again as we never quite got up early enough to do the full Sella Ronda circuit - too late to bed each night!! Recommend Ortesei - winter wonderland, with easy cruisers, sleigh rides, tobogganing etc. Perfect when you have the flu like me at the end of our holiday and couldn't cope with too much. Val-Gardena is like coming home for my husband and I. We have been there several times in December and March. In December we go always the week before the holidays and it is super. Not so many people to do the Sella Ronda, good snow, sunny but it can be very cold. I'm counting the days now ..